Pontifical Bull "Towards the salvation of the World through Sanctification". Book 1: The sacraments of The Holy Church. The material cause = A believer meeting the prerequisites of the Canon Law and the requirements of the diocese, as laid down by the bishop. The efficient cause = Any member of the clergy authorised by his or her office. The formal cause = The celebration, the oath of fidelity, the symbolism of water. The final cause = Entry into the community and the communion of the faithful. Article 2: The dogmatic nature of baptism is defined by the precepts contained in the sacraments in the Book of Doctrines. Article 3: Only a believer who understands and assimilates the basic credo may receive the sacrament of baptism (not applicable to Can. 1-I-A-5). Article 4: The Church recommends the believer to follow, and the priest to lead, according to the doctrines and ministry of the Church validated by the prefecture for the Aristotelian teaching, before receiving the sacrament (not applicable to Cdn. 1-I-A-5). - Article 4 bis: The right to rule on either the mandatory or optional parts of the pastoral teaching is left to the Episcopal Assemblies. Article 5: Children and other people being incapable of understanding the teachings can be baptized if parents, guardians or sponsors agree to provide Aristotelian education and spiritual support according to the doctrines of the Church. - Article 5 bis: Upon his coming of age, the child must confirm his baptism by a new celebration. - Article 5 ter: These people are not subject to articles 3, 4 and 9 (Can. 1-I-A-3,4,9.) of this law. The duties set by them are met by the sponsors whose presence is mandatory notwithstanding the requirement of Article 9 (Can. 1-I-A-9.). Article 6: The believers who have previously belonged to an heretical cult and having now converted to the Aristotelian religion shall officially and publicly reject their former faith before receiving the sacrament of baptism. - Article 6 bis: The presence of at least one godfather or godmother is mandatory notwithstanding the requirement of Article 9(Can. 1-I-A-9.). Article 7: The officiant shall be a priest with the duty of cleric, a deacon or equivalent. Article 8: The baptism shall take place in the parish of the residence of the believer or by default in any other sacred place. - Article 8 bis: The baptism should normally take place in the believer's parish of residence. If it is to take place elsewhere, the officiant should seek permission from the believer's bishop to perform the ceremony. - Article 8 ter: In the absence of the Bishop, the request shall be sent to the alternative person responsible or, where appropriate, the closest direct hierarchical superior. Article 9: The Church recommends that the applicant believer's baptism be accompanied by at least one sponsor or a mentor who will assist through its infancy in the community. Article 10: During the ceremony of baptism, the believer must at least formally endorse the dogmas and doctrines of the Church by reciting the Creed. Article 11: During the ceremony of baptism, the baptized person is symbolically received in the community of the faithful, either by the anointing, or by the symbolism of water, or both. Article 12: The name of each baptized person shall be registered in the registers of the parish, or the bishopric, and the general registers of the Church. Article 13: Anyone who has been baptized at a young age, having come to age, shall be asked to confirm his baptism. Article 14: Confirmation is made up of a recommended form, which is made up partly by teaching and partly a celebration, where the faithful reaffirms his belief previously given by his godparent at his baptism. Article 15: During the ceremony of confirmation, the believer shall officially endorse the dogmas and doctrines of the Church by reciting the Creed. Article 16: During the ceremony, the believer is symbolically confirmed as faithful by the anointing and/or water. Article 17: The Church recommends the confirming faithful to be accompanied by at least one godparent who will provide spiritual guidance and support in the community of the faithful. Article 18: The registers of the parish, or the bishopric, and the general registers of the Church are to be updated as necessary. Canonical text on the sacraments of the Aristotelian and Roman Church. Given in Rome under the pontificate of the Holy Father Eugene V on the second day of April in the year of grace MCDLIX. Published by His Eminence the late Jeandalf, the thirteenth of February of the year MCDLV; amended, revised and reissued by His Eminence Aaron De Nagan, Cardinal and Dean of the Sacred College, the feast day of Saint Abysm, the second day of April in the Year of grace MCDLIX of our Lord. Section II : The sacrament of marriage. The material cause = a man and woman faithful of the Aristotelian Church. The formal cause = The Office, exchanging of the vows and the covenants. The final cause = A union before the Most High and men with the aim to start a family and find the Aristotelian friendship. Article 2 : The precepts of the Church on marriage and the nature of marriage are included in Book 4 of the doctrines and sacraments of the Church. Article 3 : Marriage is the consecration of the profound agreement between two people, creating a community of life deemed inseparable, symbolising the Aristotelian Friendship in one of its most narrow forms. Article 4 : The only persons authorised to solemnise a marriage, are priests with clerical authority, as well as clerics empowered to give this sacrament. Article 5 : No marriage can take place without the permission of the one in-charge of the parish of both bride and groom. - Article 5 bis In the absence of the one responsible, it is the local religious authorities directly superior to the latter to grant such permission. Article 6 : The marriage is celebrated in the parish of residence if both members reside together or else it is celebrated in the parish of the bride. - Article 6 bis : Subject to the approval of the local episcopal authority, the marriage can take place in a noble, family, or royal chapel of one of the engaged; or the cathedral of the diocese of the engaged if residing in the same diocese, or else it is celebrated in the cathedral of the bride. - Article 6 ter : A marriage in another place must be given prior approval by the bishop in charge of the diocese of residence of the couple or at least of the diocese of the bride, and that of the prelate in charge of the location. - Article 6 quater : Marriages solemnized in the Roman basilica and churches should be subject to the prior approval of a cardinal. Marriages celebrated in royal or imperial cathedrals are subject to acceptance of the competent national consistory or a cardinal, the primate in question, or any other authority deemed competent or recognised. Article 7 : The presence of at least two witnesses from among the faithful is necessary. One representative of the bride and one of groom. They will guarantee with the espoused the marriage act. Article 8 : The couple must be composed by two faithful not subject to prohibition. Article 9 : The espoused cannot be relatives to the fourth or less degree. Article 10 : The engagement is formalized with the publication of the banns at least 15 days before the marriage date. - Article 10 bis : The banns of the marriage must be published by both parties, in the Res Parendo church of the parish of residence In Gratebus of the espoused, or each of their parishes if they do not have the same residence. - Article 10 ter : The publication of the banns shall be complete by including full names of the espoused, their home, marriage location and names of witnesses. - Article 10 quater : If for some reasons the couple should reduce the period up to the engagement, the specific application and the reasons will be made to Metropolitan see of competent jurisdiction by the couple and the officiating cleric. The latter should also inform his superiors. Article 11 : The couple shall seal their union by the exchange of vows, symbolized by the exchange of rings, before God and the people. Article 12 : In the case of remarriage, the officiating cleric will confirm the annulment or dissolution of the previous union. Article 13 : The officiating cleric or other authorised clerk will note the marriage in the appropriate registers. The Canon Law gives the framework for a marriage in a certain uniformity derived from the unity of the Church. However, for reasons of culture or custom, dioceses and provinces have the right to impose additional restrictions on marriage, according to the Pontifical Consistory or other appropriate authorities, after Congregation of the Holy Office and the Congregation for the Diffusion of Faith. Article 1 : Any request for the discontinuation, dissolution or annulment of the sacrament of marriage must, above all, be passed before the local episcopal office or a competent authority. The discontinuation of the sacrament of marriage. Article 2 : The discontinuation of the sacrament of marriage is an automatic procedure that requires only one observation from the diocesan officials. - Article 3.1 : The death of a spouse. - Article 3.2 : Entering into orders by one of the spouses. - Article 3.3 :When the entry into the orders is the reason, the discontinuation of the sacrament of marriage implies a permanent suspension from the marital duties. - Article 3.4 : When the entry in the orders is the reason and there was procreation, the discontinuation of the sacrament of marriage does not imply a suspension from parental duties. Article 4 : In a discontinuation of the sacrament of marriage, the marriage is recognised as valid and legitimate, but does not produce effects into the future. The effects occurred in the past are legitimate and maintain their full legitimacy for life. Dissolution of the sacrament of marriage. Article 5 : The dissolution of the sacrament of marriage is a termination of the latter followed by the decision of the spouses to separate and to put an end to their life as couple. - Article 6.2 : Adultery committed by one spouse, the spouse at fault is prohibited from remarriage. - Article 6.3 : The desertion of the spousal home by one spouse for a length of time longer than three months. The spouse convicted of spousal neglect is liable to be prohibited from a remarriage. - Article 6.4 : The disappearance of one spouse for a length of time longer than three months. Article 7 : The dissolution of the sacrament of marriage involves the removal of marital obligations between the spouses. Article 8 : In the case of dissolution when there has been offspring, the parental obligations remain. Article 9 : During the dissolution of the sacrament of marriage, the marriage is recognised as valid and legitimate, but does not produce effects into the future. The effects occurred in the past are legitimate and maintain their full legitimacy for life. Article 10 : Any application for dissolution of marriage is deposited to the Episcopal Office upon which the spouse or spouses are dependent before being forwarded to the competent Papal Consistory. - Article 10.1 : It is for the Episcopal Office to officialise and publish a notice of such claim, and a just discipline and expiation. This decision will then be deposited to the competent Papal Consistory to be validated or rejected. Article 11 : The Papal Consistories in territories under their jurisdiction, have full authority regarding the dissolution of the sacrament of marriage, for a just discipline and expiation, to the revision of the decision submitted by the Episcopal Office, with regards to the prohibitions against one or both spouses. - Article 11.1: The Papal Consistories in territories under their jurisdiction are entitled to review their decision after a period of twelve months of expiation. The annulment of the sacrament of marriage. Article 12 : Annulment of the marriage recognises the de facto marriage as retroactively void. Thus in the eyes of the Church, it never existed. Article 13 : During the annulment of the sacrament of marriage, the marriage is seen as invalid and illegitimate. The effects occurred in the past are illegitimate and recognised as such for life. 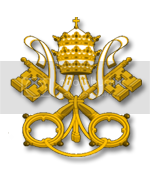 - Article 13.1 : Only the Sovereign Pontiff or his delegate can legitimise in an exceptional way the effects occurred during this life of illegitimate partnership. Article 14 : The Sacred College of Cardinals, on behalf of the Sovereign Pontiff, alone, has authority for the annulment of the sacrament of marriage. Article 15 : Any application for annulment of marriage is deposited before the local Episcopal office and forwarded to the competent Pontifical Consistory that will judge its relevance. Their opinion will be forwarded to the Sacred College of Cardinals. Article 16 : The Pontifical Consistory will act as a judge to give and issue an official decision on whether the application will be allowed. This decision may be forwarded to the Sacred College of Cardinals, whereby the latter will take an official decision. Article 17 : The causes of annulment of marriage are defined by the admissibility of the petition and are confined almost exclusively to serious procedural irregularity in the granting of the sacrament of marriage, abuse of trust or deceit by a spouse during the marriage. Canonical text on the sacraments of the Roman and Aristotelian Church. Given in Rome under the pontificate of the Holy Father Eugene V, the twenty-eighth day of March in the year of grace MCDLV. Last endorsement by the Sacred College of Cardinals on the Saturday of the XII day of the month of September in the year of grace MCDLVII. Published by His Eminence the late Jeandalf on the twenty-eighth of March in the year MCDLV; amended, revised and reissued by His Eminence Cardinal Aaron de Nagan, Dean of the Sacred College, on Sunday the thirteenth of September, the feast of Saint Ripolin, in the year of grace MCDLVII. Render official our decision regarding the nature of what some calls «civil marriage». The sacred union of a man and a woman is exclusively vested by the Holy Aristotelian and Roman Church. Conducting a union of this kind - whereby another intends to bind the man to the woman and the woman to the man - whilst one is a faithful to Our Holy Mother the Church is strictly forbidden. Similarly, faithfuls of the Holy Church cannot request such blessing, as it is not sacred. Anyone who violate this rule would be at odds with our dogma, his/her action will be considered as blasphemous. Therefore, the offender would face the justice of the Church and punishments that would follow its decision, outlined in our Canon Law. None should be ignorant of the blasphemous nature of this practice. In addition, this rule has no retroactive value. It is however recommended to the faithful concerned to do an act of contrition in the presence of the ecclesiastical authorities of their province or diocese.